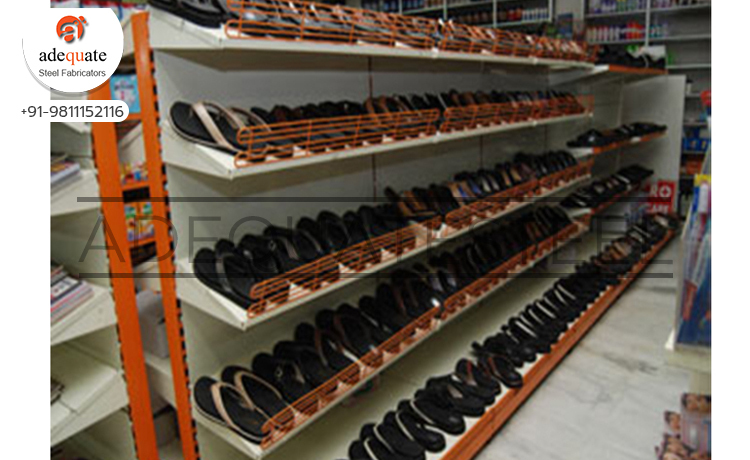 For any footwear retail showroom it is important to have the perfect racking system that will ensure that there is optimal utilization of space, better storage, good product display, easy mobility of goods on display and enhanced visibility. In addition to all these attributes it is important to understand what best is needed for a particular retail outlet and offer the best racking solution that will help the merchandiser to have an optimal balance. Adequate Steel has been pioneers in offering racking solutions for retail showrooms specializing in supermarket racks, fruit and vegetable racks, electronic racks, showcase racks, pharmacy racks, book racks, shoe racks and accessories for racks apart from offering industrial heavy duty racks as well. For shoe racks, Adequate Steel offers standardized customizable choices that can be altered and modified to suit the need and requirement of clients. There are four types of shoe racks offered by Adequate Steel and they are; metal slat wall shoe racks, glass shoe racks, mesh stopper shoe racks and footwear racks. All the racks from Adequate Steel are made out of high quality raw materials procured from reliable sources. All the raw materials are at par with high grade international standards that allows Adequate Steel to deliver stable, sturdy, durable and reliable rack constructions. Mesh stopper shoe racks from Adequate Steel true to its name have mesh stoppers that help to prevent the footwear from falling off as the racks are inclined.